Yogyakarta – Friday, February 8, 2019, FEB UGM’s Master of Science and Doctoral Program holds the second welcoming day for the new students – Even Semester 2018/2019. On this second day, the event began with Zumba morning in front of the MD FEB UGM Building. Even though they were welcomed with unfavourable weather because they were drizzling, the new students were still enthusiastic in carrying out the program. The second-day program – Researcher Enrichment (REACH) Program was a series of welcoming programs for new students. REACH The program officially opened with releasing the balloons into the sky is the symbol of the ceremonial event. A series of events on the second day was also held by the scholar day out program with the aim of introducing the campus environment to new students. 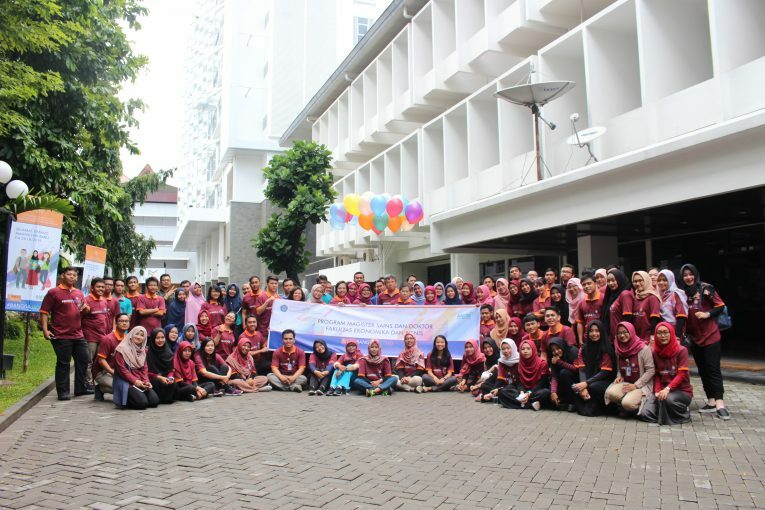 Students were guided to introduce some places and facilities available at the Faculty of Economics and Business UGM. After the outdoor event, new students are directed to return to the MD FEB UGM Program Building and receive some materials. The first material is Philosophy Approach, and Application of Learning Research Methods provided by Prof. Jogiyanto Hartono., Ph.D. This material discusses the role of Student Center Learning (SCL) in response to criticism of the learning requirement. SCL emphasizes how to improve the quality of mind, improve the attitude of mind, improve qualities of the person, and improve the ability to apply concepts and knowledge in specific situations. On this occasion, Prof. Jogiyanto also explained several learning methods, and currently, the MD FEB UGM is implementing Research-based Learning (RBL). This method emphasizes the ability to understand the theory and empirical based. Through this explanation, new students are expected to understand the design of learning applied in the MD FEB UGM. Furthermore, the second material was delivered by Prof. Catur Sugiyanto, M.A., Ph.D. with the theme “Academic Support Tools.” Prof. Catur explained several facilities (hardware and software academic tools) that could be used by students. Some of these facilities include classrooms, study rooms, student lounges, faculty lounges, BRI auditoriums, prayer rooms, and several other room facilities. Also, Prof. Catur also explains that students can take advantage of research software provided by the MD FEB UGM. Students are also directed to immediately have access to UGM e-mail accounts so that they can utilize the library and WiFi facilities available on campus. Towards noon, the event continued with disaster mitigation material with the speaker I Made Susmayadi, M.Sc. from the Center for Disaster Studies at Universitas Gadjah Mada. I Made explains the geographical conditions of Yogyakarta that need to be understood by students. Through understanding geographical conditions, students are expected to be able to recognize whether the place their live currently is in the category of a dangerous place or not. I Made also gave several explanations about the types of disasters and continued how to deal with disasters. After the afternoon break, new students were given some additional material as a briefing for student soft skills. The first material is filled by Rr. Nastiti Tour, Ph.D. with Communication Skill material. In this activity, Rr. Tur Nastiti explained the reasons why someone is difficult to communicate including 1) not used to thinking structure; 2) not used to paying attention to the environment; 3) not used to paying attention to the audience; and 4) not used to paying attention to the context. In addition, communication is also difficult if it is not able to resist emotions and selfishness, and unprepared the material. Then, Rr. Tur Nastiti pointed out some solutions and tips to communicate well.